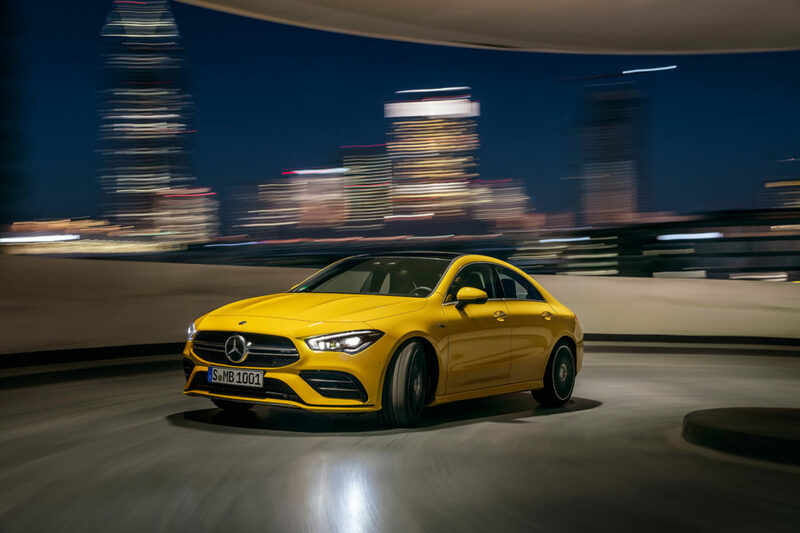 The new Mercedes-AMG CLA 35 4MATIC is the latest compact car to join the Mercedes-AMG lineup. It is powered by a new 2.0 litre 4-cylinder turbocharged engine that delivers 302 hp and 295 lb-ft of torque. 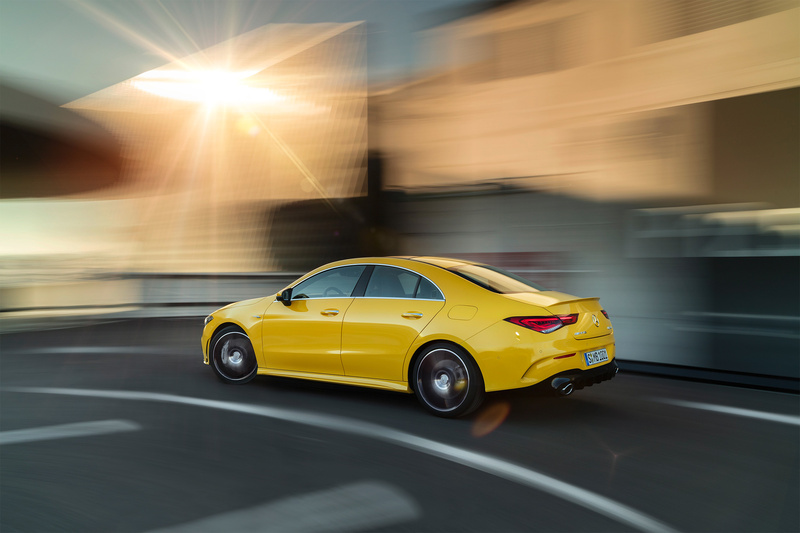 That is enough power to propel the CLA 35 from 0-100 km/h in 4.9 seconds. 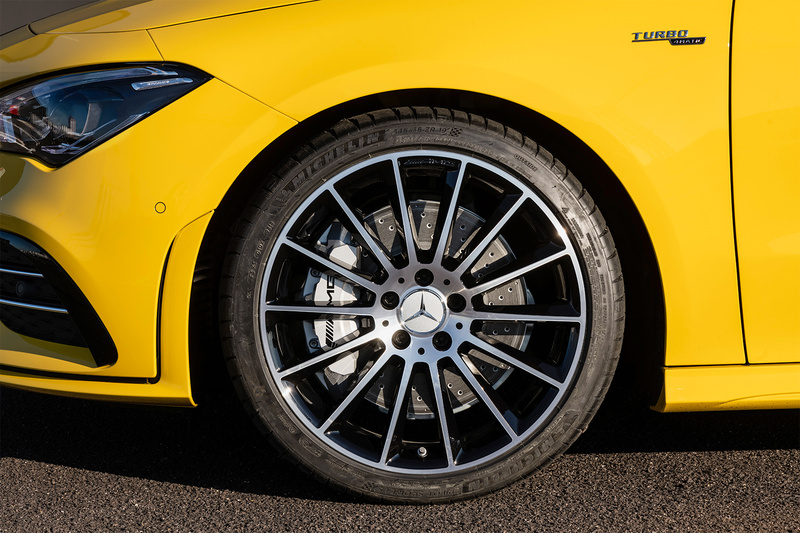 Top speed is 210 km/h or up to 250 km/h top speed with addition of the AMG Drivers Package. 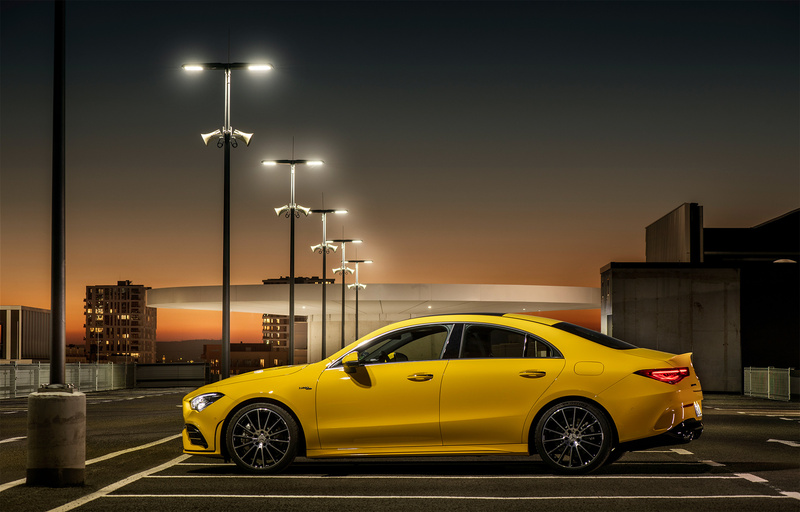 Power is sent to all four wheels via an AMG SPEEDSHIFT DCT 7G dual-clutch transmission. The new Mercedes-AMG CLA 35 4MATIC will makes its world premiere at the New York International Auto Show on April 16. Its Canadian market launch will take place in the winter of 2019. 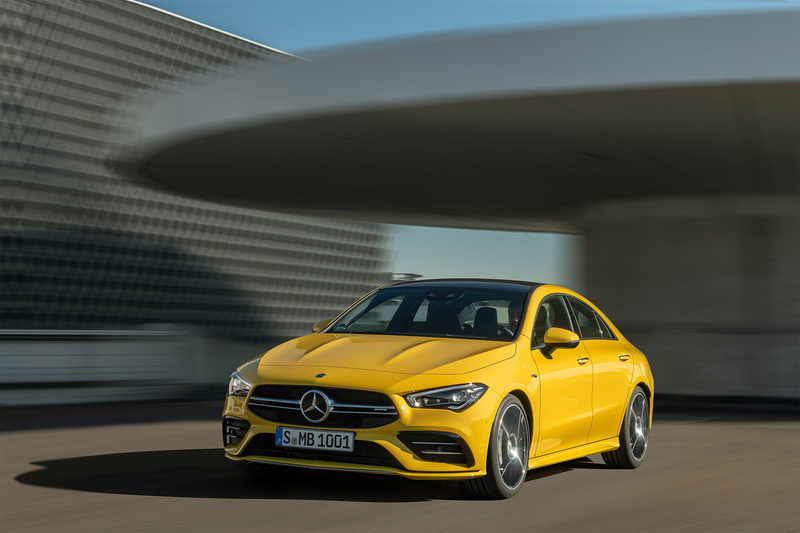 The 4-door CLA 35 4MATIC has widened wheel arches and two power domes on the hood which distinguish it from its non-AMG counterpart. The radiator grille has twin louvres, an AMG front apron with flics on the air inlets and a front splitter which provide additional distinguishing AMG design features. It is equipped with aerodynamically optimized 18-inch light-alloy wheels in twin-spoke design. 19-inch wheels are available as an option. The rear of the car is dominated by an apron with a new diffuser insert, a small trunk mounted spoiler lip and two round tailpipe trims positioned on the extreme left and right of the car. 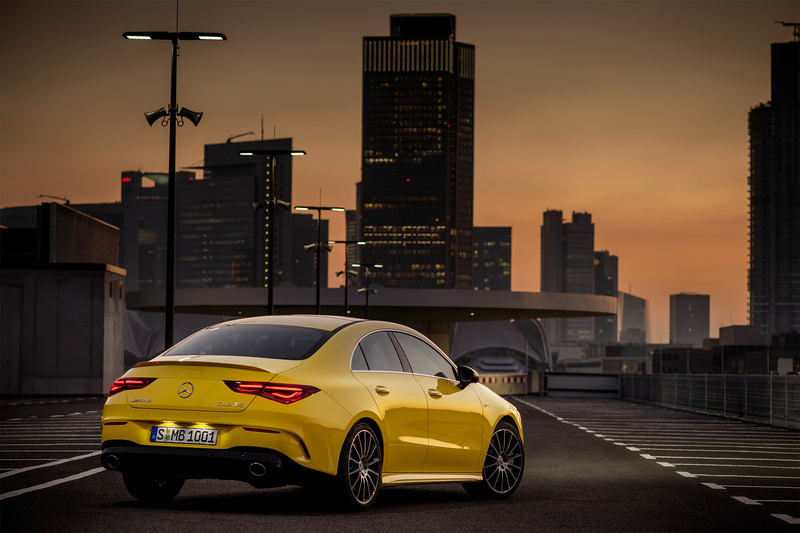 Two-piece, narrow tail lights and a license plate housing embedded into the bumper add to the CLA 35’s wider appearance. The seats are covered with ARTICO, a man-made leather, and DINAMICA microfibre in black with red contrasting stitching or ARTICO in black and neva grey. The CLA 35 4MATIC has an AMG-specific centre console in piano lacquer finish with touchpad as standard. The touchpad has additional buttons that control the functions of ESP, manual transmission mode, and AMG RIDE CONTROL suspension. In conjunction with the optional leather upholstery, the interior of the AMG-specific console of the CLA 35 features a silver chrome surround. MBUX is standard on the CLA 35 4MATIC, replacing the previous COMAND system. Numerous functions can be activated by voice-operated control, prompted by the phrase: “Hey Mercedes”. Acceleration and deceleration values (e.g. 0-100 km/h, ¼ mile, 100-0 km/h) can be measured and saved. The driver can record race circuits and open circuits, and can save them for later vehicle data recording. A newly developed algorithm precisely determines the cars position. AMG TRACK PACE detects when the car has left the circuit or has been shortened. This is done using GPS data as well as the cars acceleration, gyroscope, steering angle, and wheel speed sensors. 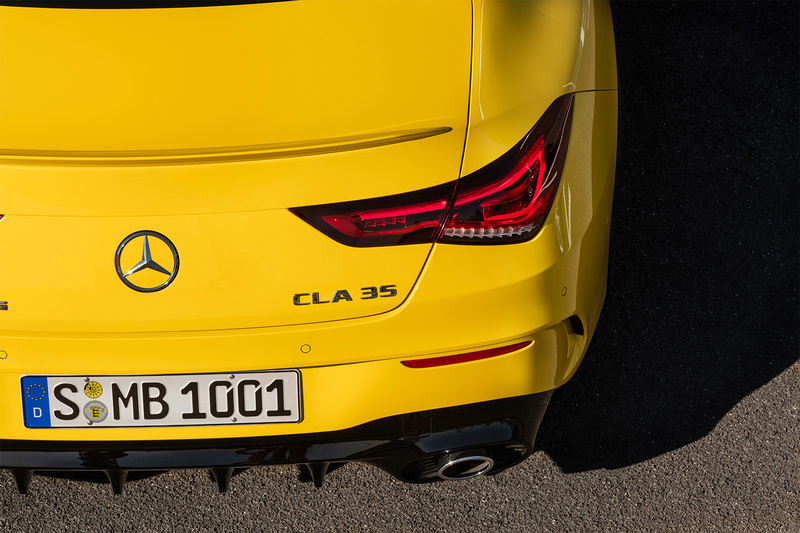 In the CLA 35, MBUX features AMG-specific content. The instrument cluster contains specific details such as the AMG start-up menu with three selectable AMG display styles. The “Supersport” mode has a central round rev counter and additional information presented in the form of bars to the left and right of the rev counter. Via the AMG menu, there are various special displays such as Warm-up, Set-up, G-Force and Engine Data. 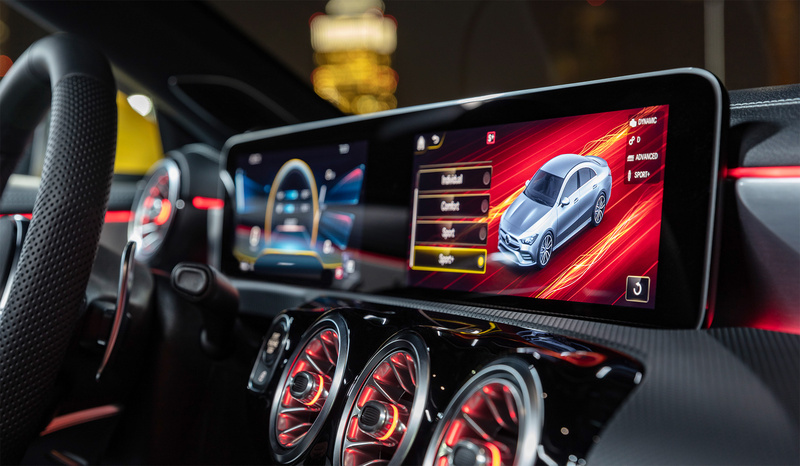 The touchscreen multimedia display can also present drivers with telemetry data, visualizations of various driving programs, and AMG TRACK PACE. The steering wheel rim with a flattened lower section, perforated leather in the grip area and red contrast stitching is both attractive and pleasant to the touch. Galvanized steering wheel gearshift paddles allow for a sportier driving style with manual gear shifting. 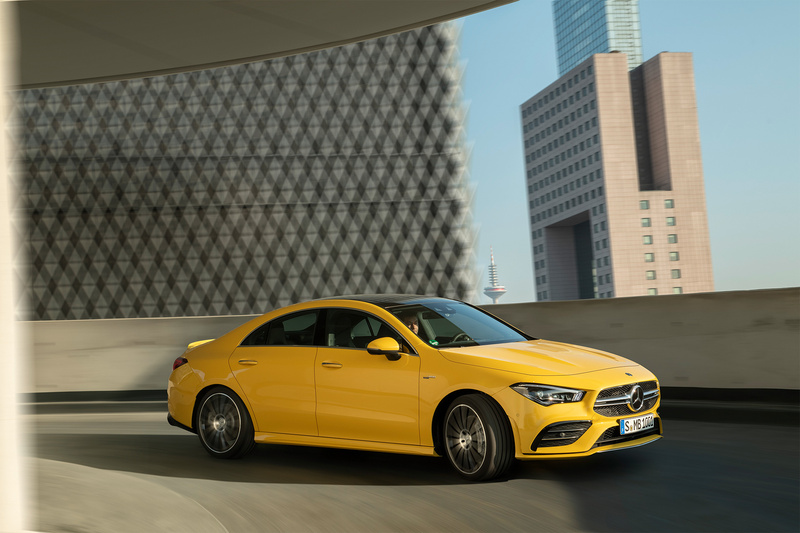 With AMG Performance 4MATIC variable all-wheel drive, the new CLA 35 4MATIC is designed to produce maximum traction and dynamic handling. Torque distribution is infinitely variable to suit the handling requirements of different driving conditions. The spectrum ranges from front-wheel drive only, to a 50:50 distribution to the front and rear axles. 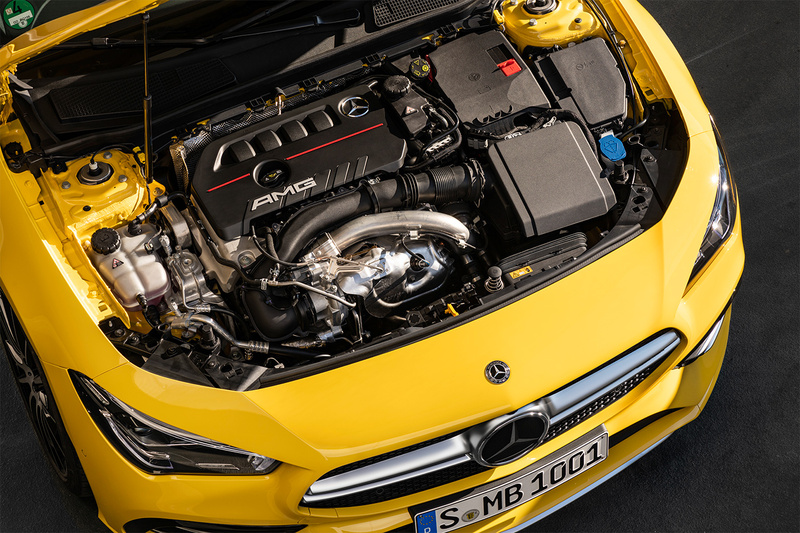 Drivers can choose between five AMG DYNAMIC SELECT driving programs. Toggling between “Slippery”, “Comfort”, “Sport”, “Sport+” and “Individual” will change the response of the engine and the timing of the transmission. “Sport” and “Sport+” place the focus on agility with a more open engine and precisely tuned transmission. In these modes, the sound of the turbocharged engine becomes much more distinctive and the ECO start/stop function becomes inactive. “Sport+” is particularly exhilarating with double-declutching during downshifts and partial cylinder cut-off via a brief delay of the ignition and injection at full load. The CLA 35 4MATIC’s high-performance braking system ensures fade-resistant deceleration and short braking distances. The front axle of the vehicle is fitted with new 4-piston Monoblock fixed callipers and 350 millimetre brake discs, and the rear with 1-piston sliding callipers and 330 millimetre brake discs. The discs are internally ventilated and perforated to better dissipate heat and prevent brake fading, even with extreme use.